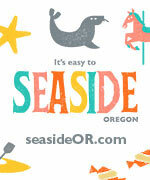 (Manzanita, Oregon) – So many crazy, funky facts about one little Oregon coast hotspot, it's rather mind-boggling. Manzanita may be small and ultra laidback, but it's chock full of curiosities. From the scary geology of the place, to wild history, ancient shipwrecks, treasure hunting and what famous person died there, to the strange glow the local waters sometimes acquire. Starting at the very beginning, Manzanita's massive Neahkhanie Mountain has its origins in a fiery march of death by a super volcano – one that, insidiously enough – could still pose a threat to the world today. When they reached this area, they filled up large canyons and cooled into basalt rock. Eventually, the outer layers of the soil eroded away and the ground often sank, leaving headlands like Neahkanie Mountain, Tillamook Rock near Seaside and Cannon Beach, Cape Meares and others along the coast. These lava flows came from the same fissure in the Earth's crust that now powers Yellowstone National Park – which is being closely watched as it could again become a doomsday volcano that would likely threaten life on the entire planet. Another funky fact about Manzanita you didn't know: some small seams of coal have been found on Neahkahnie Mountain. A group in the area called the Beeswax Project has been looking for this shipwreck, and over the years all kinds of detective work has been done, including radar soundings beneath the ground and more. This shipwreck has even sparked a host of legends about the Spanish burying treasure somewhere in the forest hills above town, but evidence for this is diminishing rather quickly. Other strange facts are associated with this galleon shipwreck, however, some of which go all the way back to observations by Lewis and Clark. From their time here in 1805-06 and onward, explorers talked about meeting natives here who were part white and apparently had European lineage. Some had said they were descended from the crew of the galleon. 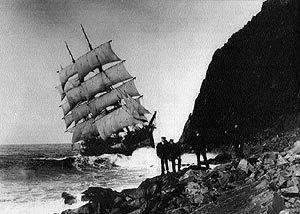 Another massive shipwreck happened in 1913 with the British full-rigged ship Glenesslin smacking itself against the rocks at the tip of Neahakhnie Mountain. It's said the captain was drunk and ran it aground in almost perfect weather for no good, discernible reason. That debate still rages on. Chunks of it were still fairly visible until the 80's in some spots. Still today you can spot some bits of it if you're walking along that precarious bottom of Neahkahnie, filled with large boulders. This is rarely accessible because of the tides, however, so don't consider walking there unless it's an extremely low tide event. More than one Manzanita-based historian has noted the mysteriously inscribed “W” rocks found on top of Neahkahnie Mountain. In previous decades these had been attributed to “pirate” legends surrounding the galleon, but more recent evidence points to these rocks being navigational markers of some sort. Almost every ship crew had their own way of marking claims or navigational numbers in writing; these were not standardized at the time. Some locals have theorized these were left by former pirate Sir Francis Drake and his crew. You have to hike here to find them, but some very wild and curious rocky shapes exist at the edges of Cape Falcon – beneath the mountain – like Cube Rock and Pulpit Rock. These are spectacular monolithic monsters of basalt which sometimes resemble ancient Roman ruins – but made by giants. 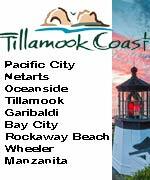 See more at the Manzanita Virtual Tour for these. Those same hiking trails – just an offshoot from the trail going down to Short Sand Beach – also lead you to a precarious but stunning overlook that stands over what's called Treasure Cove (pictured above). It was here in 2003 when a well-known Hollywood producer fell to his death. Paul Stojanovich, known as a producer for the show COPS and a creator of shows like World's Scariest Police Chases, fell from one of the vantage points here while posing for a photo. This helps illustrate the caution that must be taken if you venture to these cliffs. On somewhat infrequent occasions, you may get lucky and spot the glowing sand phenomenon at night on the beaches of Manzanita. Being so dark, it's easier to see it here than many other beaches along the Oregon coast. (Above: a different kind of glow over Nehalem Bay as a fog layer hangs just above it at night). This exciting event is caused by bioluminescent creatures called dinoflagellates, which are microorganisms related to algae and plankton which give off light like fireflies. If there's a lot of them in the area, they hit the Nehalem Bay and nearby rivers. Dip your hand into the bay from a dock and you may see an eerie, ghostlike blue glowing trail behind your hand. Some locals say that swimming in the rivers at night with this happening causes your body to look like a skeleton in the water. More on glowing sand here. 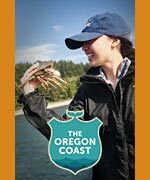 Keep an eye on Oregon Coast Beach Connection for futher, more detailed articles on these subjects. More details are available at the Manzanita, Rockaway Beach Virtual Tour, Map.